- GIFT CERTIFICATES IS AVAILABLE. Fancy Nails & Spa Shop has been in business since 1995. We are conveniently located at Cinema Theater in Poway City. Our office specializes in professional French Acrylic Pink & White, Gel, Manicures, and Spa Pedicures. For faster services, we have a team of specialized and professional staff, who can perform simultaneously a Manicure and Pedicure services-this will help save you time while enjoying one of our state of the art relaxing spa chairs. Fancy Nails & Spa Shop offers Facial and Waxing services at a very competitive price. All services are performed exclusively by experienced licensed Manicurists and Estheticians in a relaxing and comfortable private station. 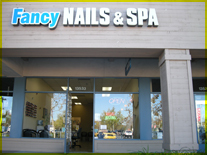 At Fancy Nails & Spa Shop your safety is our top priority. We take pride in using only NEW buffers, files, and pumices-absolutely no reuse of these tools. In addition, all our spa chairs and instruments are disinfected and sanitized prior to each use, which is strictly according to California State Board of Barbering and Cosmetology rules and regulations. CopyRight©2008 . All Rights Reserved. Website designer by webmaster.